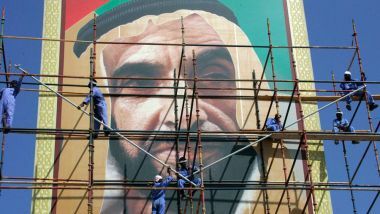 The year is 2006 and these workers are on a mission to complete this giant portrait of UAE Founding Father Sheikh Zayed in time for the marking of the second anniversary of his death. It is November in that year, and the structure the men are tirelessly working on is as big as the heart of the man being honoured. A man who the nation is currently celebrating in this, the Year of Zayed. This image is a timely one given that it was announced this week that the latest tribute to Sheikh Zayed – the Founder’s Memorial in Abu Dhabi – will officially open to the public on April 22. Located at the edge of Emirate’s Palace, before the Corniche Breakwater road, the memorial site features a visitors’ centre and an installation by artist Ralph Helmich. The giant image in this 12-year-old photo and the tribute to be opened next week are just some of the many across the Emirates.